Global RESP Corporation (GRESP) is pleased to announce the winner of the second quarter RESP Contest: Sarthak Uperty from Brampton, Ontario! 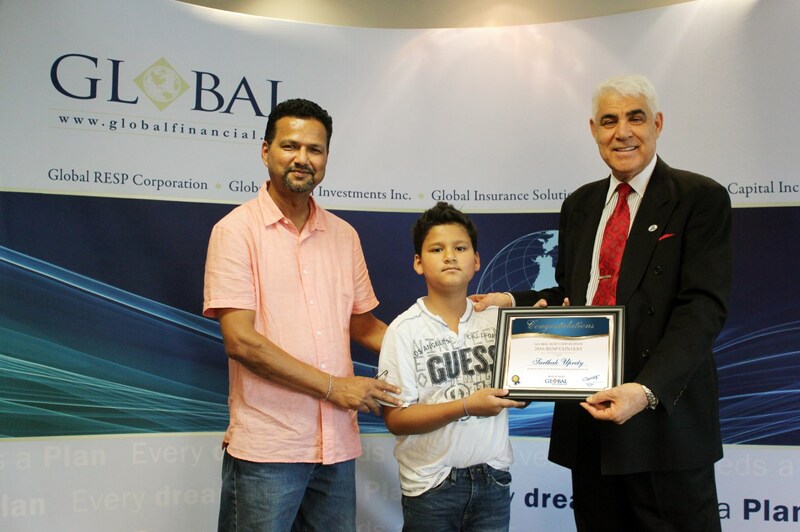 His father, Chinta Uperty, entered him into the contest for a chance to win a Global Education Savings Plan worth up to $5,000. The Uperty family are existing clients of GRESP, and they have already enrolled both of their children in Global Plans. Now that Sarthak has won the contest, he will have an additional boost to his plan’s contributions that will help guide him to a successful future. At just 8 years old, Sarthak already has career aspirations. When Sam Bouji, owner of GRESP, asked him about what he wants to be when he grows up, he answered that he had military ambitions. Sarthak was presented with a ceremonial framed certificate to commemorate his luck and as a reminder of his promise to put education first. Sarthak was such a gentleman and even took time to shake the hands of all of the Global staff members in the room! A Global Plan, when registered under the Income Tax Act (Canada), allows the beneficiary to be eligible to receive up to $7,200 in Canada Education Savings Grant and up to $2,000 in Canada Learning Bond for a total of $9,200 in government grants. Earnings on contributions and government grants grow on a tax-deferred basis. Congratulations to Sarthak for being the second quarter winner of the GRESP Contest! We know that you will accomplish great things with your future endeavors!